If you have any questions relating to love, relationships, money, health or future happiness, Moon Predictions will give you a reading offering years of experienced Clairvoyants, Mediums and Psychics. 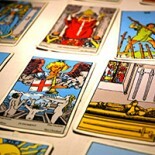 We offer telephone and email readings with only the best hand picked readers available. Over the last few years there has been a very large increase in the number of people having psychic readings on the phone. Some people do wonder if a telephone reading can ever be as accurate as a face to face reading, however, I believe that face to face readings definitely help the reader as to whether or not they are on the right track just purely by your facial expressions. Obviously, a psychic reading on the phone does not give the reader this advantage, therefore, they have to tune in using only their psychic skills and not use your expressions as a gauge. A good reader should be able to tune in within a few minutes and give you something specific to ensure that a connection has been made. Our live psychic telephone readings typically last about half an hour. This reading can take many different forms, depending on the type of reading that you request. We offer a range of different readings including using the following tools: Tarot cards, ancient gypsy cards, the crystal ball or the I Ching. View a list of our psychic readers. When choosing a reader – it is always worth looking on the website for a reader with skills that match your requirements. For example, you might want to connect with someone who has passed over – then you would need to speak to a medium. Or, you might just simply want a tarot reading. All of the testimonials on our site are genuine and have been provided by our customers. Take your time to read through these testimonials as they may help you choose a reader which matches your needs. Moon Predictions offer a 5 minute guarantee to all of our customers – If for any reason you feel that you are not connecting with your chosen reader, or they with you – disconnect the call within the first 5 minutes and call the receptionist who originally processed your booking – She will then be able to void your transaction or reset your time and put you through to another reader. A Psychic reading between yourself and a psychic is an open channel of energies. Our experienced Psychics will immediately make you feel relaxed and comfortable, so don’t be afraid to ask questions , just relax and enjoy your reading. Moon Predictions is one of the most respected and recognised International leaders in spiritual guidance. We have built up a team of readers giving genuine psychic readings. This is a premium phone line service and your reading will be paid for by the cost of your call and calls will end after 29 minutes. Choose from our talented team of readers and simply enter their relevant PIN Number once you are connected. You can also click on the ‘Readers Currently Live Online’ button on the right of all our pages to see who is currently available. In Option 2, payment is taken over the phone simply and securely using a credit card. See also our text, email and astrology & tarot readings pages. If you wish to contact us, please use one of these methods below.